Wastes are the material residues of economic activities, and therefore include pollution, discarded production materials, and discarded outputs. Because these residues can be harmful to human health, their distribution among countries, regions, neighborhoods and individuals is an important topic. The concept of maldistribution is therefore appropriate in this context. Wastes are qualitatively very different from labor, and we have to think about them in a different manner. By its nature, labor must be absorbed by human beings if the work is to be performed. However, human beings are by no means compelled to absorb wastes. In principle, all wastes could be diverted away from human habitation and processed by the environment. Note that our concern at this point is not environmental degradation, but determining how the natural cost experienced by human beings can be minimized. Clearly, the best way to do this is to ensure that wastes don’t impact people at all. However, this will likely fail to at least some extent. We must therefore seek to perfectly distribute the wastes that have entered the human domain. Akin to labor cost, this is achieved when each unit of waste is assigned to the person who incurs the lowest possible natural cost. Any distribution that does not meet this criterion is called waste maldistribution. As with labor, a population has an absorption capacity for wastes. This refers to the group's aggregate ability to minimize their negative health effects. The absorption capacity for a waste depends on the number of people involved and on the overall pattern of tolerance for the waste. “Tolerance” refers to the point where the absorption of a waste begins to degrade health. As noted above, this capacity is strongly affected by a population’s most vulnerable members. See the following figure. Maldistribution of wastes depends on three factors: the number of people exposed, the physical vulnerability of those exposed, and the degree to which these people have exceeded their tolerance levels. This graph is somewhat unusual because it depicts natural cost explicitly. ENL normally depicts natural cost as the difference between the labor cost and input cost curves. Another unusual aspect of the graph is that the natural cost it depicts is restricted to pollution and similar wastes, thereby excluding habitat destruction and other environmental changes associated with production. A final point is that wastes are assumed to be capable of decreasing but not increasing health. This means that, although natural cost in general can be positive, zero, or negative, in this context it is restricted to being either zero or positive. Let's now examine the graph and extract its meaning. The lower curve, labeled NCp, reflects the perfect distribution of wastes. Until output level Q1 is reached, the population is below its tolerance level for the waste in question, and no natural cost is therefore incurred. Beyond this point, natural cost becomes positive, and the curve rises slowly in accordance with the population’s waste absorption capacity. Now assume that maldistribution occurs. That is, some of the waste is assigned to individuals who have already reached their tolerance level, even though others are below this point. This typically occurs when pollution “hotspots” are permitted to form. Another possibility is that waste is assigned to the most vulnerable, which occurs when we ignore different sensitivity levels for environmental toxins. In such cases, the population’s absorption capacity declines and the tolerance level shifts left to Q2. In other words, aggregate health will begin to degrade at a lower output quantity than previously. In addition, the natural cost curve rises more steeply than before (NCm). 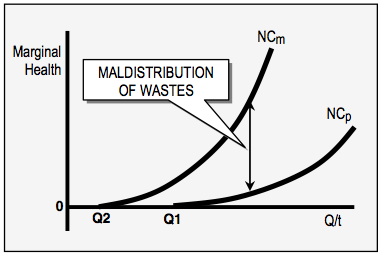 As shown, the difference between the two curves represents the maldistribution of wastes. In this situation, let’s assume that the expressways and plants are socially necessary and that their wastes cannot be diverted away from the New York City population. Under these conditions, the wastes mentioned in the article should be distributed among the five boroughs rather than being concentrated almost exclusively in the South Bronx. It is of course impossible to apportion each unit of waste individually and to achieve perfect waste distribution, but a cruder approach could still be effective. Perhaps the sewage treatment plant could be located on Staten Island rather than in the Bronx, and the waste-transfer stations could be placed in Queens and Manhattan. More people would then suffer from the pollution, but the waste absorption capacity of New York’s population would rise, and the aggregate health damage would decline. The current maldistribution of wastes in New York, and in many other cities around the world, clearly reflects the political clout of the rich in diverting wastes away from themselves and toward the area’s less affluent inhabitants. ENL's concepts cannot prevent this clout from being exercised, but it can certainly help the poor in exposing the irrationality of waste maldistribution, thereby allowing them to more effectively express their anger and concern. 1. “A Study Links Trucks’ Exhaust to Bronx Schoolchildren’s Asthma”, by Manny Fernandez, New York Times, October 29, 2006.